How Do I Become a Fire Fighter? Thank you for your interest in a fire fighting career with the City of North Ridgeville. The North Ridgeville Fire Department is the largest dual-role, fire and EMS provider in Lorain County. Our growing department has a progressive attitude toward safety, customer service, and lifelong learning by our members. 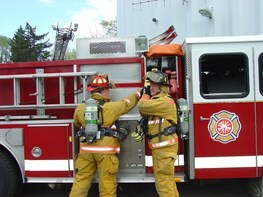 We encourage you to consider a career in firefighting and come join our team. The City of North Ridgeville is an Equal Opportunity Employer. Salary: Fire fighter/Paramedic D starting salary as of January 2018 is $59,843.19; January 2019 $61,249.50 and January 2020 $62,688.86. There is a $500.00 initial clothing allowance, also, an additional $250.00 after completion of one year of service. Life Insurance: The City shall supply each full-time employee with life insurance in the amount of twenty thousand dollars ($20,000) at no cost to the employee. Schedule: The standard work week is 50.769 hours. This is accomplished by working 24 hours with 48 hours of combined with Kelly days. Pension/Retirement: Employees are eligible for retirement through the Ohio Police & Fire Pension Systems. Employees must have 25 years of service and have reached 52 years of age. Salary Progression: The North Ridgeville Professional Fire Fighters Local 2129, through its collective bargaining agreement with the City of North Ridgeville negotiate salary progression. Workers Compensation: Medical bills are paid and disability payments are made in accordance with the State of Ohio Bureau or Workers Compensation Laws. Health Care Benefits: The city provides a generous health care plan for employees and family members. Cost sharing is subject to the North Ridgeville Professional Fire fighters, Local 2129, collective bargaining agreement. Educational Incentive: When the employee receives or has received an Associate Degree in Fire Science/Technology, Urban Studies, Community Health, or Public Safety Management after his/her date of hire, the employee shall receive eighteen hundred dollars ($1,800.00) annually. If an employee reaches or has received a bachelor Degree in Fire Science/Technology, Urban Studies, Community Health, or Public Safety Management after his/her date of hire, he/she shall receive twenty four hundred dollars ($2,400.00) annually. Hiring Process: The City of North Ridgeville conducts a Fire Fighter/Paramedic entrance examination approximately every 2 years. The entrance examination begins with a written exam and an agility test. Successful candidates may then be invited to a fire department interview, Computer Voice Stress Analysis (CVSA), psychological examination, and a physical examination as determined by the Police & Firemen's Disability & Pension Fund before being offered a position. Age: NRCO Section 248.03 Eligibility for original appointment. Minimum age requirements are as stated in the Ohio Revised Code 124.42. Education: All applicants must be graduates of a standard four year high school or equivalent. Citizenship: Applicants must be citizens of the United States or have legally declared their intention of becoming a United States citizen. Certification: All candidates must be certified as paramedics in the state of Ohio at the time of their appointment. Carry a high-rise standpipe pack (2-50 foot sections of 1 ½ inch hose weighing 50 pounds) to the third floor of the fire tower. Deposit the hose in the designated location. After task 2 is completed, this hose will be returned down the stairs to the starting location. From a third story window, using a hand motion hoist a 50 foot donut roll of 2 ½ inch hose (about 50 pounds) connected by 5/8 inch rope. This task will be completed twice. Using the Keiser Force Machine, and a nine-pound hammer, drive a steel beam 5 feet. Pick up the nozzle and move a 1 ¾ inch charged hose straightforward 75 feet. Drag a 175 pound dummy a distance of 100 feet. Applicants may be rejected for a deficiency, abnormality, or disease which would, in the opinion of the medical examiner, interfere with the efficient performance of the duties of the position. Cuyahoga Community College will issue a certificate of completion indicating the time it takes to complete the tasks. The certificates are valid for one year.